The Yahoo! Sportacular iPhone app aims to centralize all your favorite sports statistics and updates into a sleek, easy to use application. Do you regularly find yourself visiting numerous sites for updates your favorite teams? Sure, you could subscribe to a bunch of RSS feeds to centralize the reporting of scores, but you’d probably still end up visiting sites for news and other information. Sportacular also works on your iPod touch and there is an free HD version available for the iPad as well. Sportacular features almost every sport you can imagine. Even international leagues are included. For US leagues can find scores for MLB, NBA, NFL, NHL, MLS, NCAA, and NASCAR. You also get soccer (futbol) new and scores from the EPL, La Liga, Serie A, and the Bundesliga. Right from the start, you can browse around and look at scores and current standings. There are even graphical rosters to show playoff games and team’s positions. It is really nice to see all the scores in a single program that gets right to the important points while keeping everything uniform in appearance. 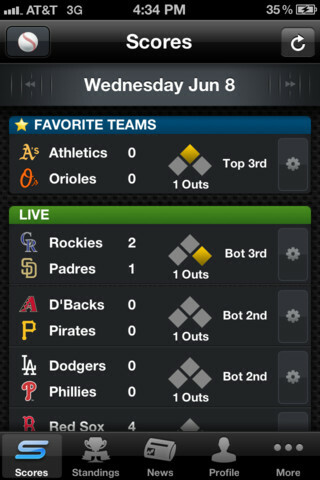 This iPhone app is not just a fancy version of a webpage that show scores. 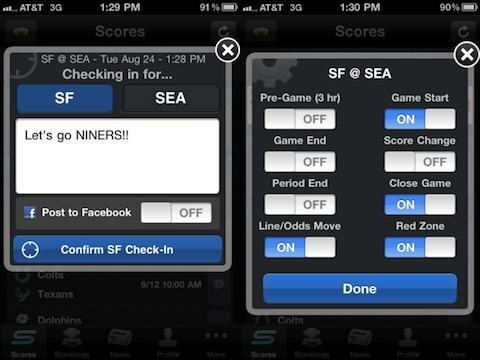 You can also select favorite teams and set individual notifications to come to your device whenever a game ends. There are also sport-specific settings and features. You can easily track your picks and leaders and keep track of players’ performance. Another excellent feature is the news section. Any articles relevant to your favorite team posted via major news channels are instantly available. You can browse news by sport or only see things that pertain to your favorite sports or teams. You’ll find yourself feeling very connected to your team’s activities when regularly using this app . I like the look of this program. It looks very sharp on phone or touch and gives you a lot more space on the iPad . Sportacular is easy to navigate and the sports icons are a nice little touch. I like that once you get down to the ‘sport’ level, everything becomes customized to fit that sport. It would not make sense to try to display Nascar race data the same as NBA game results. I only have a few rather small complaints about this otherwise superior application . It’d be nice if news and other items could be cached for offline viewing. This is especially true for non-phone users who may not have a constant wi-fi signal. Additionally, it sometimes takes a lot of clicking around to get to what you want. While the overall design is never confusing, it sometimes feels like you are backing in and out of sports and team level data quite a bit. Overall, I find this program indispensable to sports fans. If part of your routine is regularly checking several different sites for the latest sports news, this app might be a godsend. The more sports you follow, the more you’ll probably appreciate what it has to offer. AppSafari review of Yahoo! Sportacular was written by Darius Reimm on October 27th, 2011 and categorized under App Store, Free, News, Reference, Sports. Page viewed 5830 times, 1 so far today. Need help on using these apps? Please read the Help Page. Having a hard time viewing all my favorite teams on the ipad version (especially soccer teams). It seems I can only have teams for one league (ex: premier league or la Liga, not both). It may be bc I have too many favorite teams. Also, I have the alerts set for every game, however, when I look at t games in the future for my teams the alerts are not shown when I go to view them. So, I find myself manually setting alerts for every game even tho I have them saved in the default or whatever you wanna call it. I find this problem on my iPhone, too. Any ideas what’s going on with either of these?